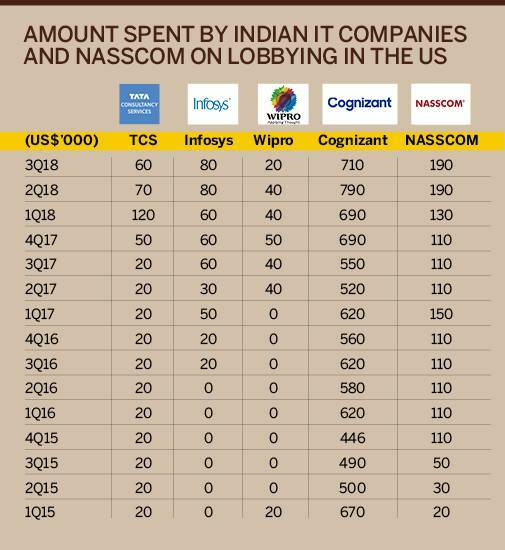 Indian IT firms and industry body Nasscom are shelling out more than ever for lobbying in the US, ever since Donald Trump took charge as the US President. The latest note from CLSA shows a substantial increase in lobbying spends by individual IT companies like TCS, Wipro and Infosys along with Nasscom in the last two years. Software lobby groups engage with Washington, largely on issues related to tariffs, taxes, immigration and foreign relations, which directly impact the Indian IT industry, since North America contributes over 50 per cent of revenues for most companies. Even though there has been a general sense of increased protectionism in the UK and Australia, the US has been the biggest concern as the stakes are very high in this geography for IT companies. The need to protect business has become even more imminent under the Trump regime with increased protectionism and lack of clear policy direction. It's no surprise that the need to be seen as a US friendly business house is an unspoken mandate. For example, the amount that India's largest IT company TCS is spending on lobbying has increased four times from $80,000 to $380,000 a year (run rate), while for Infosys this has gone up from negligible to $320,000 a year. Even Wipro, which hardly spent any amount on lobbying two years back, is now spending close to $200,000 a year. Cognizant, on the other hand, has for long spent more than its Indian peers and continues to do so with extensive engagement at senior levels in Washington as per the note. A former general counsel of one of the above mentioned IT companies, who did not wish to be named, said, "Indian IT companies can no longer take the US government for granted. I understand that the level of engagement with office(s) of several senators and officials is far greater now than, say, even five years ago." Increase in individual spends of companies itself is a testimony of how IT companies are now no longer relying just on Nasscom, but also making out their own cases. While uncertainty around H-1B visas has been among the biggest concerns for these companies, the latest move by the US to revamp the H-1B visa processing has already raised concerns for Nasscom. In a statement, the industry body said, "Companies have already begun assessing their needs and planning their submissions for next year, so we are concerned about the uncertainties that could arise as the government seeks to implement another major change in the H-1B process during that timeframe." Even as some of these underlying concerns subsist, most Indian tech companies have already increased their local hiring and are undertaking substantial CSR (Corporate social responsibility) work in the US to mitigate any risks arising out of allegations of employment discrimination and also to improve their positioning as a US friendly company.